From Left to Right: Francois Branders (Owner), Brandon Henry (Graphic Designer)and James Carruthers (XBC-IT). The business was started as a hobby in 1958 by a Boksburg church minister who sought to reduce printing costs for his parish. With support from the church congregation and the local community, the demand for printing turned this hobby into a small business. In 1995, the shop was taken over by his son, Francois Branders. It's a thriving business today, with a significant portion of its output comprising variable data printing of manuals and books. "We wanted to upgrade our digital print offering to the local market," says Branders. "Speed, cost-effectiveness, and advanced personalisation were our key requirements. We needed a digital printer that could offer fast turnaround on items such as customised manuals, business cards, envelopes, signs, banners, and letterheads. Our customers also wanted to be able to have items printed to order, which cuts costs and saves time. The Versant 180 met all our requirements and more." Remarkably, since the installation of the Versant 180 in November 2017, Branders says, the business has doubled its existing print volume to an average of 87 000 impressions per month, and increased its turnover by 35% (compared to the first six months of 2017). "Never in 30 years of being in business have we received such high levels of service from a supplier," he adds. "That has made all the difference to our output." Prior to the Versant 180 upgrade, the business was using office printers from a number of different suppliers. Among the key problems Branders Printing Co wanted to address was an inability to ensure colour consistency for the capturing of corporate colours, and to print on digital magnetic and synthetic media. In addition, it was receiving different levels of service from different suppliers. As a result, growth was being restricted, and an investment in new print technology was required to take the print shop forward. The Versant 180 offers automation and quality in a compact footprint, and delivers on speed and productivity, at 80ppm and an average monthly volume of 80 000 pages. It prints on a variety of media types, including coated and uncoated papers, bright papers, labels, business cards, glossy brochures, window decals, durable and synthetic papers, greeting cards, tabs, embossed, polyesters and custom solutions, and it also supports mixed-stock jobs. The press offers variable data printing and in-line numbering, and can print on NCR (no carbon required) carbon sheets for books. "The purchase of the Versant 180 has streamlined Branders Printing Co's commercial operations, allowing it to boost its digital capabilities, and to offer extremely competitive pricing, which has increased print volumes," says James Carruthers, sales executive at XBC-IT. "It's also benefiting from more competitive shorter runs, an ability to print on up to 350gsm (ideal for business cards and company literature), and to handle long sheet prints. Its calendar printing business (tents and long sheet) has also increased significantly." 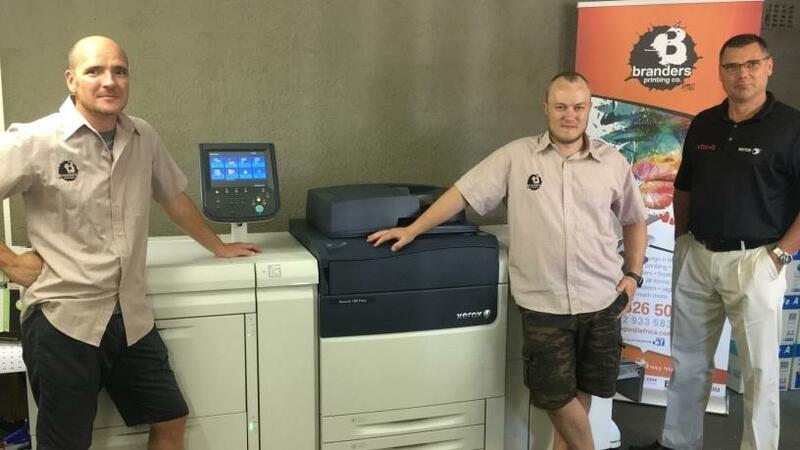 Branders Printing Co investigated a number of options before deciding on the Versant 180 as a result of Xerox's sizable footprint in South Africa's commercial print sector, as well as Xerox's top-notch reputation for reliability and excellent service. "Keeping colour consistent is a vital element of branding," says Branders. "We feel confident competing for profitable colour jobs now, because the Versant 180 enables consistent colour to be achieved quickly and easily. Our finished products meet customers' demands, and are also generating repeat business. We are extremely happy with our decisions and look forward to a long relationship with Xerox."